From 2007 through 2018, births in the US have declined by 470 thousand on an annual basis, or an 11% decline. The US fertility rate has likewise cracked lower, from 2.12 births to 1.72, an 18% decline (2.1 births over a females childbearing years is considered zero growth). This has resulted in 4.5 million fewer net births in the US since 2007 than the Census had estimated in 2000 and again in 2008. This is over an entire years worth of births that never took place. 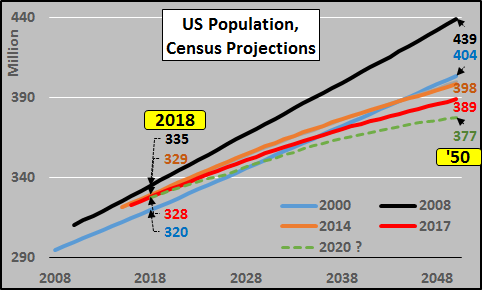 The sharp decline in births, against an anticipated rise, and a deceleration from anticipated immigration has resulted in the Census downgrading US population growth through 2050 by over 50 million persons (detailed HERE). This decelerating growth and outright declines are happening across the globe among the "wealthy nations", leaving little growth opportunity for the "poor nations" (detailed HERE). The reason for fast declining birthrates since 2007 in the US and among most nations globally seems to be the current ZIRP and low interest rates and Quantitative Easing programs which have the effect of inflating asset prices. The majority of assets are held by large institutions and post-child-bearing age populations. The flow through of these policies are asset prices rising significantly faster than incomes. For example, non-discretionary items like homes, rent, education, healthcare, insurance, childcare, etc. are skyrocketing versus wages. For young adults, this means a far greater reliance on debt to educate themselves and a far greater portion of their subsequent income to service that debt. Greater reliance for young adults on debt to purchase a home or a greater portion of their income to pay their rent, provide healthcare, insure themselves, or provide childcare (as both parents are more typically working full time). The net result of these federal government and central bank policies to boost the stock market, home prices, and collapse interest paid on savings are collapsing birthrates and collapsing total births. This is diminishing present and future demand and quality of life for the young, poor, primarily non-white in perhaps the greatest transfer of wealth mankind has seen. This is creating an economic doom loop whereas fast rising asset valuations push up the costs of living far faster than wage growth, pushing birthrates (and present and future demand) lower. The lower birthrates fall, the greater the reliance on asset boosting policies, and the majority of young, poor, and minorities with little or no assets are most harmed...wash, rinse, and repeat. The chart below shows the US fertility rate since 1970 plus the Census estimates for fertility rates from January, 2008 and January, 2017. The '08 and '17 estimates show an expected fertility rate plus an extreme high and low fertility potential. Looking back at the 2008 Census fertility projection, the worst case scenario that the Census could envision in 2008 has come true. Birth rates have collapsed over the last decade, hitting, 1.72 per female of childbearing population in 2018. Strangely, now with a decades very clear trends in hand, the most recent Census projection made available in January of 2017 couldn't even conceive of our current reality, let alone something like the fertility rates the US and so many other nations are experiencing. 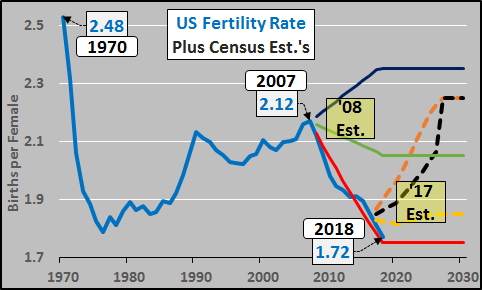 The base case is a laughable accelerating fertility rate through the middle of the decade while the US is currently significantly below the lowest possible fertility rate the Census could put to paper in 2017...and fertility rates are still falling fast. The shortfall economically and from unfunded liabilities (like Social Security with their own assumptions built off the failing Census estimates), is of radical (and worsening) proportions. This means Social Securities 2032 projected demise is far too optimistic...and a significantly sooner failure is imminent. 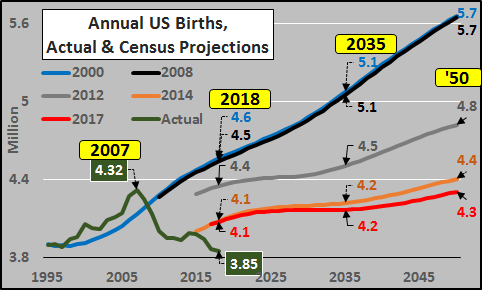 The tanking fertility rate has resulted in declining births since 2007 versus continued and ongoing Census projections of an impending turnaround (chart below). The chart below details the Census population upgrades from 2000 to 2008, and then massive downgrades since 2008. From the 2008 to 2017 projection, that is a decrease of 50 million Americans. And as the green dashed line suggests (based on actual births and immigration since the 2017 projection), a far lower projection is coming. As I have previously detailed, over 90% of the decrease is among the under 45yr/old population. But the largest declines in the fertility rates and immigration are among Hispanics, hard hit by the rising cost of living with relatively low offsetting asset holdings. 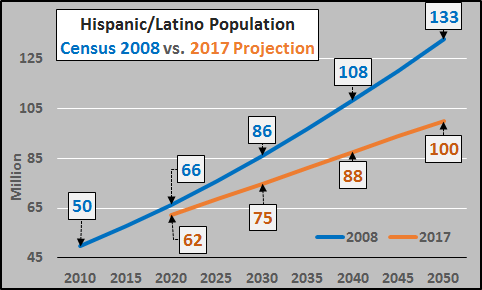 This has resulted in a 50% decrease in the 2008 vs. 2017 Census projected Hispanic population growth from 2020 to 2050. Of the 2017 versus 2008 projected 50 million fewer Americans by 2050, it is the disproportionate decline of 33 million Hispanics that is driving this. Of course, this was before the current administration came into power and before the far lower birth rates that have occurred since 2016. Said more simply, significant further downgraded population growth projections are coming and I expect the bulk of the downgrades to be among the Hispanic segment of the population (while Native American's will continue to be the most significantly impacted). But hypercritically, almost all the projection downgrades will be among the under 45 year old population, particularly among Hispanics...the population with the highest birthrates in the US. The meme of relatively positive US demographics is all but dead. So, the US continues the ludicrous debate over "Trump's Wall" and internationally births continue collapsing from China to Russia, across Europe, Japan, and South Korea, etc.. The culprit for the decelerating births is ongoing central bank and federal government "medicine" to goose asset prices, destroying the future to ease the wealthy and elderly's passing. The result is collapsing fertility rates the world over...passing the financial gains to a diminishing minority of asset holders and the losses to the young, the poor, and those with little to no assets. While supposed "progressives" in America call for more of the same via Modern Monetary Theory, it's time to discuss the removal of the plaque from the Statue of Liberty with the words "Give me your tired, your poor, your huddled masses yearning to breathe free"? The only real question is what the new "message" will read?